Happy Saturday! What is your plan for today? It’s school holiday, I guess some of you heading out of town for short vacation, balik kampung, handout at the malls or just chill at home. 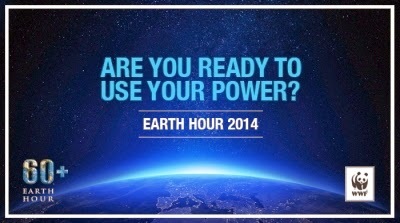 Well, today is the International Earth Hour Day 2014. So remember to do your part, lights off for an hour at least from 830pm. Are You Ready Use Your Power to Make Change a Reality? If you are at home try to switch off the lights, computer, air conditioning, television and etc or try to keep it at minimum. If everyone could contribute a little bit effort it will definitely gives a big impact to our mother nature. Use our power to make change a reality!